Our free longtail keyword tools do an awesome job in finding keywords for you that are narrowed down versions of your seed keyword. What they can not do though is actually understand the concepts and topics behind it, finding synonyms and related questions or products. Hundreds of millions of data points allow us to draw connections and give you related keywords for your query! We have 93+ million and counting keywords in our database that fuel your results. Unlike Adwords Keyword Tool, we have no motivation to hide keywords from you. You get all useful information we can give you. Depending on your seed keyword, you get up to 20,000 related keywords. Have a look at our examples below to see what that looks like. All the data you know and love, regularily updated for global, english searches. Sort by any metric and see get an instant overview of the pricing and competition distribution for sub-niches of your topic. Use our related keywords tool in your browser, download CSV for easy spreadsheet import or access the data by API. No matter how you want to work, we support it all, one price. Filter by terms and even topics and metrics with a few clicks! You can see how expensive and competitive sub-topics are with a single glance. Longtail keyword tools only find expansions of the seed keyword. Our related keywords tool goes way beyond that into the realms of pure magic. It gets you semantically related keywords by leveraging hundreds of millions of data points in more than 93 millions (and counting) english keywords and enriches them with up to date search volume and more. What is our "related keyword tool" about? Let's say you work with a keyword like car insurance. You'd probably work with longtail keywords like the one to the right. This list has some awesome keywords and you can find thousands of them with our free longtail keywords tool or with our API once you subscribe. But they only show you a vertical segment of your topic – keywords that include your seed keyword. The second list shows you some of the thousands of english keywords our new related keywords tool has found. They are all relevant for car insurance, but cover the topic from very different angles, finding synonyms and common use cases for car insurances. Does this sound useful to you? Test risk free for $5 for a whole day with full functionality! This is pure magic! Find english keywords that are semantically related. "keyword research" also finds terms like "adword tools" or "seo software" to give you an idea. Go PRO and get global traffic data and more included! Find phrases and questions you would never be able to think of yourself. 1 You can always end your contract to the end of your billing period, just send us an email. 2 Limited to 10 requests per minute and 1000 requests per day. Need more? Contact us! 3 Limited to 5 requests per minute and 100 requests per day. Need more? Contact us! Many tool suppliers rely on our PRO APIs as well as custom built endpoints and datasets. We have the data, the expertise and the infrastructure to gather and make sense of billions of datapoints to give you the tools to help your business and your customers. You want to leverage this for your business? Let's talk! You can use our API with our PRO plan and get longtail keywords and related keywords with search volume and CPC prices automatically! Find our keyword.io API documentation here. 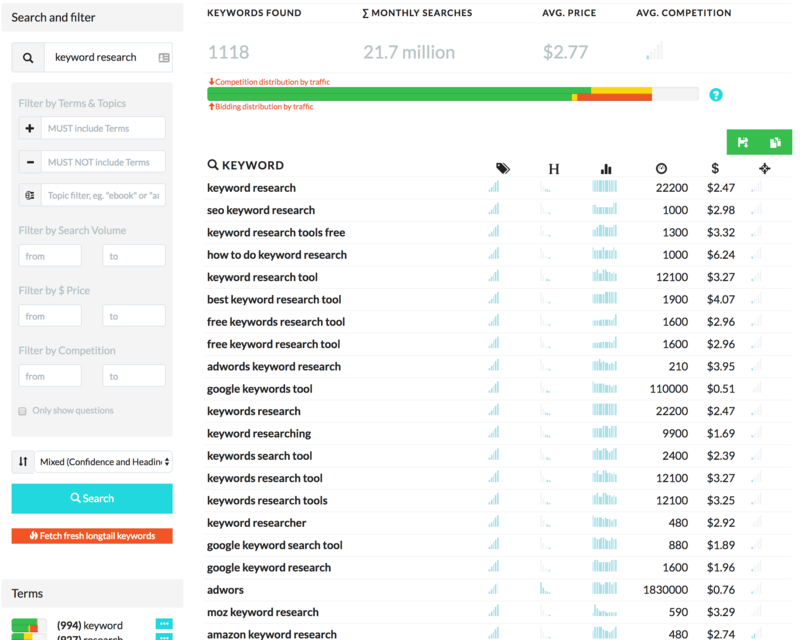 Yay, you can start doing keyword research now! Your new plan is being set up now and should be ready before you finish reading this sentence. If you don't see the related keywords tool link in the header after reloading the page within a few minutes, please don't sign up again but shoot us an email and we'll look into it.